If you've got the itch to go island hopping, we have the perfect destination for you: the Caribbean island of Saba. At Disciples of Flight, we love to provide you with travel recommendations for great backcountry airstrips, cozy getaways and occasionally more exotic destinations. This one’s definitely a little more exotic. If you’ve got the itch to go island hopping, we have the perfect destination for you: the Caribbean island of Saba. The Juancho E. Yrausiquin1 Airport (the island’s only airport) has one runway. At just 1,299 feet long (398 m), this runway is the shortest commercial runway in the world. So short, in fact, that the airport is closed to jet traffic. All commercial flights to the island are in smaller, prop driven regional aircraft such as the BN-2 Islander or the Twin Otter2. So, what awaits you on the island of Saba? Amazing scuba diving adventures, walks along gorgeous trails and (in the right conditions) golden beaches, homey villas with breathtaking sea views, hiking on the slopes of the appropriately named Mt. Scenery, and more! We’ve got some great information for you, so let’s get started. Saba is part of the Caribbean Islands, about 200 miles east and a little south of Puerto Rico. Nearby islands include Saint Martins, Saint Kitts, Saint Eustatius, and a little farther afield, St Johns and the US and British Virgin Islands. In 1632, a group of British sailors shipwrecked on the island and when they were rescued, they reported it to be uninhabited (though it may have had some Arawak Indian settlements previously). A few years later, Saba was claimed for the French. However, the Dutch governor of nearby Saint Eustatius decided to get in on the action, and sent several families of colonists over to Saba. In 1664, the English decided they wanted possession of the island, and forcibly removed the Dutch colonists when they refused to swear allegiance to England. Over the next hundred and fifty years or so, the island changed hands between the English, Dutch and French repeatedly, and also served as an occasional haven for pirates due to its forbidding coastline. Finally, in 1816, Saba became a part of the Kingdom of the Netherlands, and has remained under Dutch control since. Modern day Saba is home to 1,991 people. There is one main road on the island (cleverly called ‘The Road’) which connects the four cities on Saba. They are The Bottom (which is the island’s capital), Windwardside, St. Johns, and Zion’s Hill3. 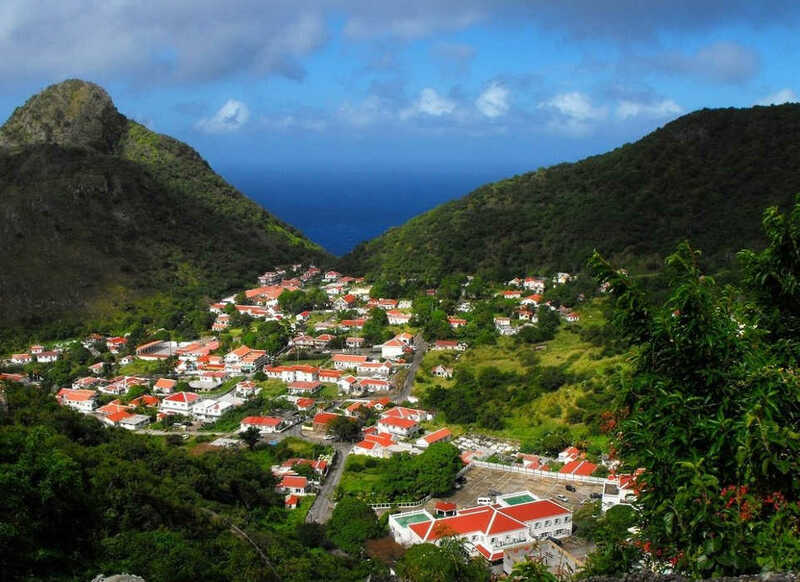 And though Dutch is the official language of Saba, English has been taught in schools since the 1800’s, and has become the primary language spoken on the island. Additionally, since 1 January 2011, Saba adopted the US Dollar as it’s official currency, replacing the Netherlands Antillean Guilder. It wasn’t until 1977 that the government of Saba opened the Saba Tourism Board. This somewhat more recent focus on tourism, and the remote nature of the island mean it only receives about 25,000 tourists annually, making it a little more quiet and less hectic than many Caribbean destinations. This in one reason Saba is often referred to as the ‘Unspoiled Queen’ of the Caribbean. If you decide to fly to Saba, be aware that the Junacho E. Yrausiquin Airport does not have avfuel. So you’ll want to be sure you have plenty of fuel to get out and back. 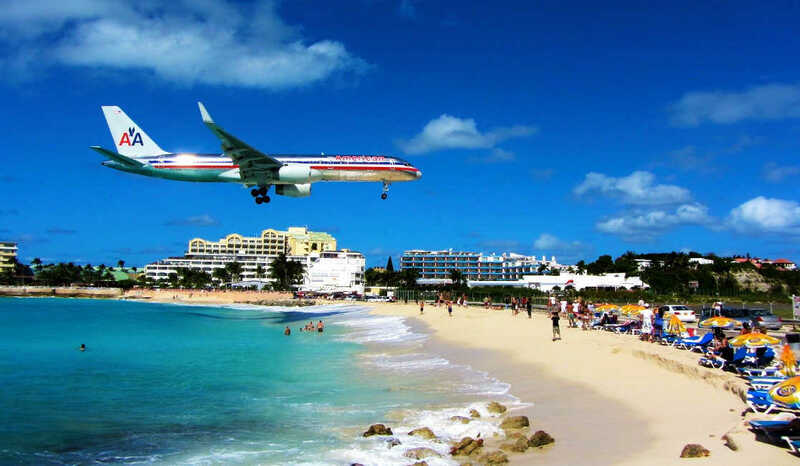 The nearest airport with fuel is Princess Juliana International Airport roughly 30 miles to the northeast on the Dutch half of the island of Sint Maarten. If you would prefer not to make the flight to Saba in your own aircraft, due to the lack of avfuel on the island, Princess Juliana airport is a great place to park your plane, and catch one of the daily commercial flights out to Saba. Princess Juliana International Airport recently added a new building for an FBO, Arrindell Aviation, to accommodate an increase in international and local private aircraft traffic. In addition to avfuel, they also provide lounges, dining, and dedicated customs. If you are flying to this airport and landing 10, the approach is over the water. Some pilots can become disoriented regarding their perceived altitude when flying VFR. Regular instrument checks and situational awareness are recommended to help combat this. Also, when departing runway 10, you’ll be required to turn, so you can avoid rising mountains in the departure path. One final thing to note: due to runway 10’s close proximity to Maho beach, it has become a favorite location for plane spotters taking photos of approaching aircraft. However, if you’re interested in making the flight to Saba in your own plane, here are the details. Once you’ve landed, you can get around the island on ‘The Road’ using either Saba’s taxi service, or renting a car from the island’s only service, Morgan Car Rental. Accommodations are available all over the island in the form of hotels, cottages and villas, and Saba has a wealth of great places to eat, a variety of stores to shop at, and even some great places to pick up local art and crafts. 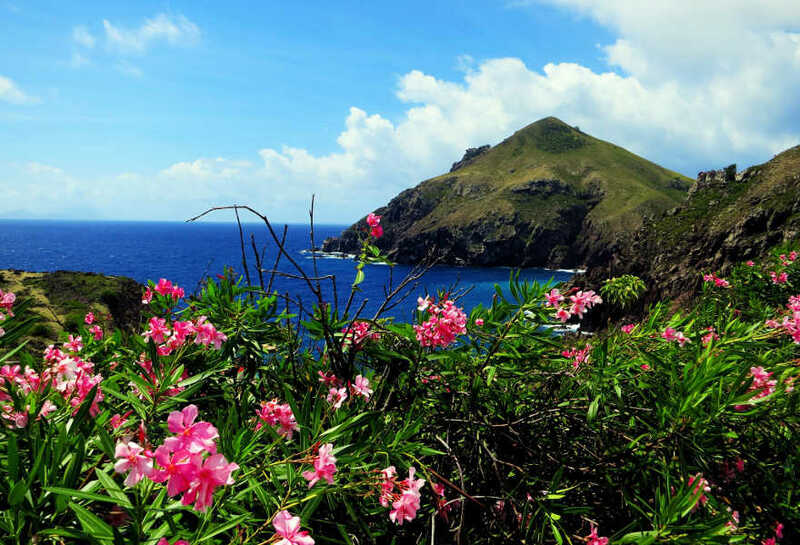 But if you’re traveling all the way out to Saba, it would be a shame to miss out on the hiking and scuba diving opportunities the island presents. 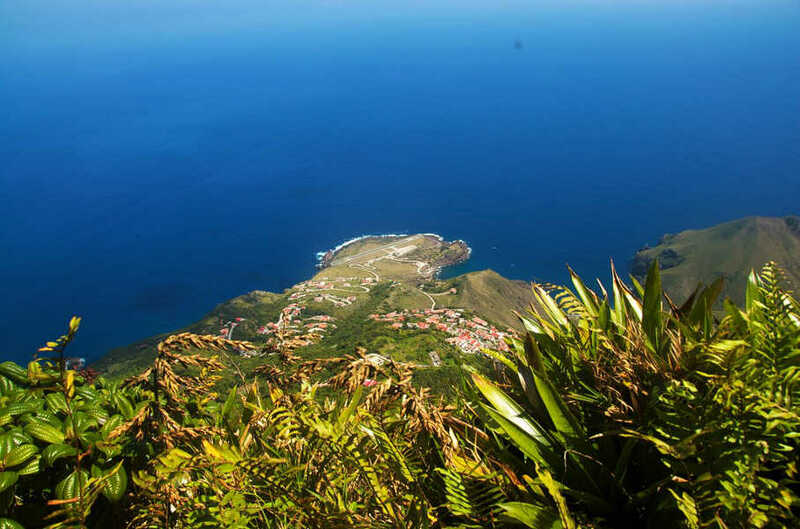 The island of Saba is a dormant volcano, and depths of up to 1000 feet (304 m) can be found within a half mile of the shore. 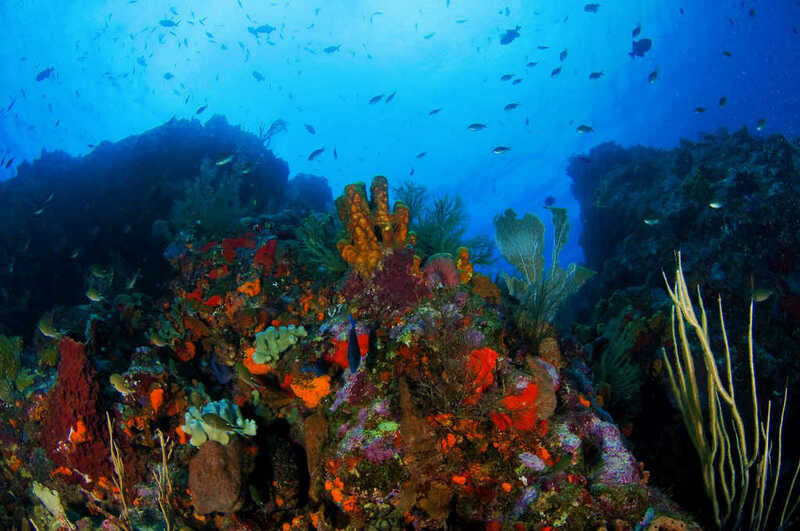 Established in 1987, the Saba Marine Park protects the unique volcanic marine ecosystem around the island and provides an amazing opportunity to view the plentiful marine life, coral reefs and volcanic towers that rise up from the depths. With an estimated 150 species of marine life in the waters around Saba, you may see Horse-Eyed Jacks, Great Barracuda, Wahoo, Tarpon, Wrasses, Blue Tangs, Chromis, Surgeonfish, Parrotfish, Angelfish and five varieties of shark, including Hammerheads. Additionally, you’ll have a chance to see sponges, sea fans, turtles, conch, lobsters and a variety of crabs. – When on a diving expedition, listen to your dive leaders, and follow their plan. – Take only pictures, and please don’t remove anything from the marine park. – When taking pictures, adjust all your settings before framing the shot to ensure that you and your camera equipment don’t touch the coral reef. – Don’t leave anything behind. – Don’t harass the marine life. – Don’t feed the marine life. – Using light sticks is not permitted, as they might potentially be ingested by the marine life. – Use of gloves is not permitted, except when you are holding the line during your three minute safety stop. Climbing to the top of 2,877 foot (877 m) Mt. Scenery4 can be an amazing experience. Starting on the windward side of the mountain, the hike takes about 90 minutes. During the hike, you start among Mountain Palms, Tree Ferns, and Elephant Ears. But as you reach the upper slopes of Mt. Scenery, you’ll enter an ‘Elfin Forest’, full of Mountain Mahogany, covered in Epiphytes, Orchids and other rare plant life. The summit of Mt. Scenery presents stunning panoramic views of the island. Another great hiking destination are the Tide Pools at Flatpoint. Enclosed between rocks and cliffs, and filled with crystal clear sea water, these tide pools are a great way to see the colorful marine life around Saba without putting on a dive suit. These tide pools can occasionally be subject to dangerous rip tides and incoming waves, so be sure to check the current conditions at the Trail Shop before heading out. Just down the road from the trail-head to the tide pools is Saba’s only public, natural swimming pool. Locals have built a rock wall in the cove, to serve as a barrier to the open ocean, so locals and visitors can enjoy a relaxing and safe swim. Sand was recently added to the pool as well, creating an artificial beach. On many weekends, local can be found barbecuing here, presenting a great opportunity to meet and get to know some of the locals. Finally, depending on conditions, the rocky shores of Wells Bay are occasionally transformed into a strip of beautiful, golden, sandy beach. When revealed, this occasional beach is usually empty, and provides a unique opportunity for some great snorkeling. – Let someone know where you are going, and when you expect to be back. – Pay attention to your footing, and please stay on the established trails. All the trails on Saba cross private land, so please respect the property. – Don’t pick any of the fruit from the local trees. Again, they are on private land, and the fruit belongs to someone. – Use the provided trash bins for your trash, and if you see litter, please pick it up. – If you are traveling with a dog, please keep them on a leash, under control at all times, and please clean up after them. – It’s very warm and sunny in the Caribbean (you don’t say…), so please be sure to bring extra water and sun block when you go hiking. – Do not disturb, harass, or harm the local plant or wildlife. This is against the law! Saba represents an opportunity to experience the Caribbean at a slower, more relaxed pace. It has spectacular sites to see, offers some unique opportunities to private pilots, and will likely be a destination you’ll want to make return trips to. 1 – The airport is named after Aruban Minister Junacho Irausquin. 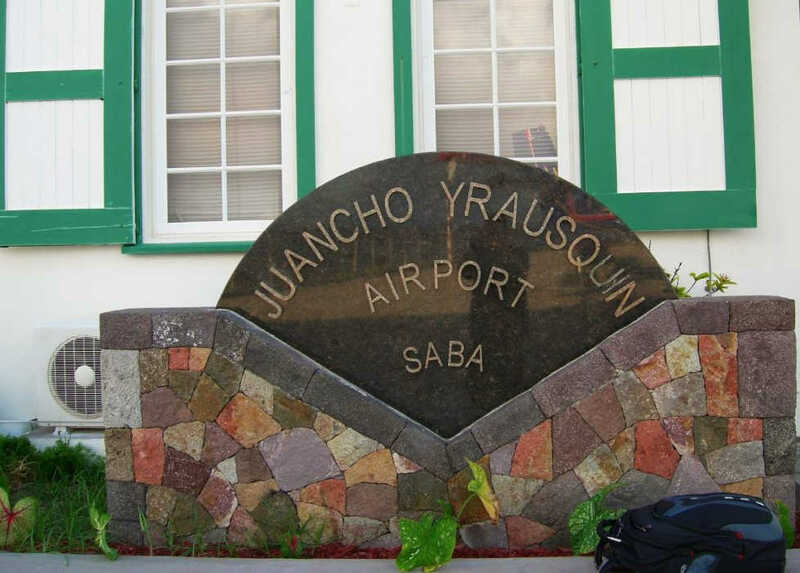 However, due to a typo in the early days which was replicated in all the early documentation, an ‘I’ became a ‘Y’, and the airport became the Juancho E. Yrausquin airport. 2 – These aircraft generally fly in from the nearby island of St. Martin, a trip that takes about 15 minutes. 3 – Zion’s Hill was originally called Hell’s Gate, and many locals still refer to it by that name. 4 – At 2,877 feet, Mt. Scenery is the tallest point in the Kingdom of the Netherlands.